A ball which starts just right of target and gracefully works (draws) back to the target is a thing of true beauty. (Right handed golfer) The perfect draw is a shot every player wants to consistently be able to hit. With the following knowledge and help from Trackman, you will now have an understanding of how to pull this shot off. First, you’ll need to grasp the importance and relationship of clubface and path. In each image, the red shaft, arrow and/or circle represents where the clubface is pointing at impact and the blue shaft, line and/or circle illustrates the path of the golf club through impact. With an iron, the direction the clubface is pointing at impact is responsible for 75% of where the ball starts, and with a driver or fairway wood the clubface dictates 85% of the ball’s starting direction. Thus, it’s fair to say, if you want to hit a draw where the ball starts right, the clubface actually needs to be OPEN at impact (shown by the red arrow in the image). A positive face angle of 1.0, as illustrated by the number inside the red circle, will give you a ball, which starts right of target (just as a negative face angle or shut clubface will give you a ball which starts left of target). Club path, the blue line, NOT clubface, is responsible for the curvature of the golf ball. In order to hit a shot which starts right and curves left back to target, the club path of the golf club needs to be moving farther out to the right than the clubface is pointing at impact (notice where the blue line through the golf ball is going in relation to the red arrow). In this example, the club path is 2.7 degrees to the right and you have a face angle of only 1.0 degree to the right; giving us a club path which is pointing farther to the right than the clubface. The yellow circle in the image is face to path and it’s a simple calculation telling us which way the ball will curve (a negative face to path will curve the ball left and a positive face to path will curve it right). A 1.0 degree face angle minus a path of 2.7 degrees equals a face to path of -1.7 degrees, giving us the resulting ball flight (pink line) of right to left. This next part is the key distinction to make: the clubface is OPEN to the target line but CLOSED to the club path. For a right handed player, a clubface which is closed to the club path will move right to left and one which is open to the club path will move left to right (the opposite would hold true for a left handed player). So, next time you find yourself wanting to hit that tight draw starting right remember this: For a ball to start right of target, the clubface needs to be open to the target line and the club path (movement of the golf club through impact) needs to be moving farther to the right than the clubface is pointing. 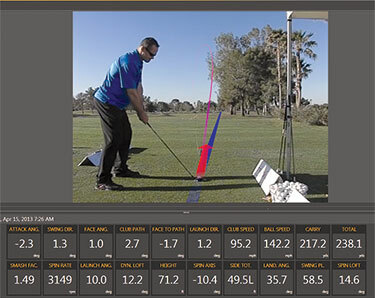 For more on this, visit the Trackman page on Scott’s website at www.scottsackett.com/trackman. Follow Scott on twitter @Scott_Sackett and like Scott Sackett Golf on Facebook to keep up to date on all his contests, tips and articles. Be sure to watch for next month’s edition where Scott will cover how to hit the perfect fade. Scott Sackett, GOLF Magazine Top 100 Teacher the past 14 years, just voted as one of Golf Digest’s Best Teacher in the State for the fifth year in a row. Director of Instruction at Park Meadows CC in Park City, Utah and while in Scottsdale he teaches at McCormick Ranch Golf Club. Scott can be reached by email at scott@scottsackett.com.